Caesar Cardini (February 24, 1896 – November 3, 1956) was an Italian Mexican, chef, and hotel owner, who is credited with creating the Caesar salad. He was born in the region of Lago Maggiore and had at least four siblings: Alessandro, Carlotta, Caudencio and Maria. While the sisters stayed in Italy, the three brothers emigrated to America; Alessandro and Caudencio eventually were in the restaurant business in Mexico City. Alessandro, who was called Alex in the USA, is reported to have been Caesar's partner in Tijuana, Mexico. After having worked in European gastronomy, Caesar went to the United States in his early 20s. He ran a restaurant in Sacramento, then he moved to San Diego where he was in the restaurant business. At the same time he engaged in the same business in Tijuana, Mexico, where he could avoid the restrictions of prohibition. He married Camille, and had a daughter, Rosa Maria Cardini (1928-2003). Cardini is credited with having created "Caesar's salad" which became fashionable among Hollywood and other celebrities, especially after he had moved his restaurant a few blocks to the hotel built c. 1929 (nowadays called Hotel Caesar's). 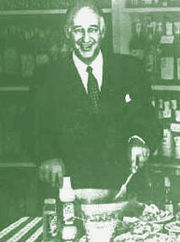 The family moved to Los Angeles in 1935 and Cardini focused on the production and marketing of his salad dressing which he trademarked in 1948. He died in Good Samaritan Hospital on November 3, 1956 in Los Angeles following a stroke at his home at 8738 Bonner Drive and was buried in Inglewood Park Cemetery. His daughter took control of Caesar Cardini Foods Inc. Later, the label Cardini's was sold to a third party. It is still popular and offers more than a dozen varieties of the original recipe. In Tijuana, Hotel Caesar's, nearby Caesar's Sports Bar and Grill and Caesar's Palace seem to serve an "original salad".